What is membership in the NC Retail Merchants Association? You’ve invested thousands of dollars in your business and profession. We help you protect and grow that investment. We help you to be a better retailer! We offer excellent educational opportunities! Because you get news you can actually use! We have guidance and research worth reading! Whether you’ve been in business for years or just starting out, you must stay current to be successful. 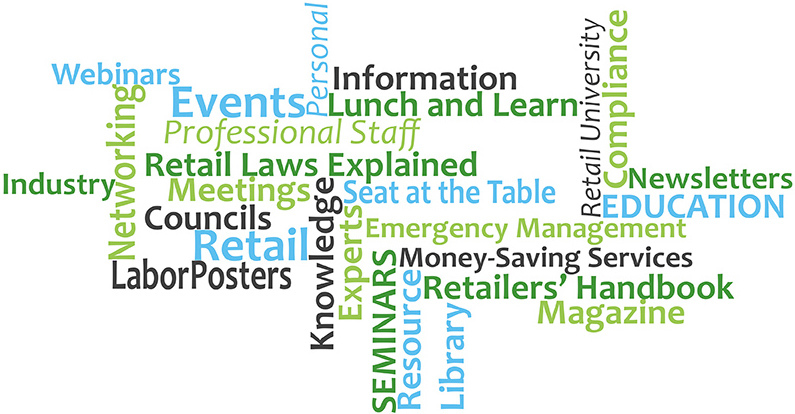 Members have free access to webinars and quarterly events on relevant subjects impacting retail store operations. We know it’s hard to stay on top of the ever-changing rules and regulations mandated by local, state and federal governments which is why we do it for you! We also break down new mandates into easy to understand, step-by-step directions on how you can comply. Through its educational foundation, NCRMA offers a retail scholarship program to its member company employees, spouses and dependents. Ten $2,500 scholarships are awarded annually to students seeking higher education. The NCRMA lobbying team gives a voice to the retail industry in North Carolina. NCRMA members also have the exclusive benefit to call on our legislative team at any time. We work on your behalf, meeting directly with state lawmakers and regulators to assist you so that elected officials understand how their actions affect businesses in our state. We never charge, and we’ve combined all of the required postings into one, attractive Super Poster. All of North Carolina’s laws impacting retail store operations are compiled and explained in easy to understand language. Updated after each legislative session. A group of services offering discounts or special packages for retailers including email marketing, e-commerce, IT support, marketing, Credit Union membership, security systems, workers’ compensation insurance, and more. Our partners provide a deep bench of expertise to help you with tax, legal and real estate issues. Retailer of the Year Awards program, including a presentation event and a personalized press release for every winner. For retailers who need access to their stores during emergencies, natural disasters, bad weather, etc. NCRMA has a seat at the table and provides real-time updates and access to Waivers that allow your employees/trucks to get to the store.